Have you ever seen yourself as an artist? Every artist has their preferred medium. Some artists love oil paints, others like to carve their masterpieces out of marble. But if you don't see yourself as an artist yet maybe you just haven't found your right medium yet! Don't doubt yourself just yet. This Bump and Bruise kit might be the answer and your very own face might be your canvas! And if we're being truthful, we just can't wait to see what you come up with. 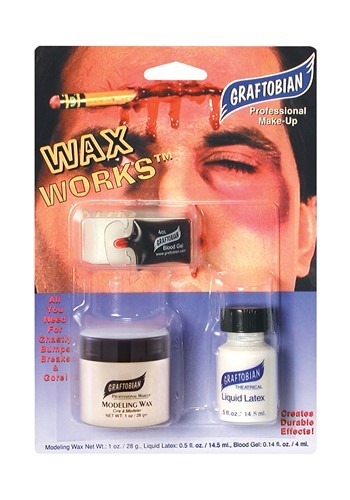 This kit will let you make your face 100 percent more disturbing. Actually, you can go as far as you choose. The modeling wax can create swollen features, cuts, or gore. The theatrical liquid latex is handy to create bloody scabs and a number of liquidy horrors. And of course, the look is topped off with the traditional pouch of blood because what are a few bumps and bruises without a little blood? Now, we don't really know why you're going for a black and blue look. Maybe you're heading out for Halloween. Maybe you're staring in a play as a major boxer. Maybe you just want to be prepared for a gnarly idea that pops into your head. Either way, this set will be there for you when you decide to cruise for a bruise.